« 4/11 What is going on in Macau these days? » 4/15 Virginia: Is State Sen. Stanley right? Are casinos a sign of civic death? The Kentucky Derby is only a couple of weeks away, and the racing world has once again turned its attention to the Run for The Roses. The most exciting 2 minutes in sports comes once a year, on the first Saturday in May. It’s certainly the most anticipated race of 2019, for both fans and insiders – since the Derby is only for three-year-olds, a horse (and his owner) only gets one shot at being draped in roses in the Churchill Downs winner’s circle. My first Derby, in person at least, was 1986, and the memory is as vivid now as it was then. That spring, three of us racing guys decided, after having played the Derby at our local simulcast facility for years, that it was finally time to experience the race first hand. One guy had been to the Derby years before, as a young man, so, by default, he became our guide. Given that the three of us were all (relatively) poor educators, we opted for budget travel: we’d just drive to Louisville from Cleveland in an old van and, once we got there, join the mayhem in the infield, the least expensive way into the track. As far as sleeping went, we figured it’d be easy enough to just sleep in the van at one of the state parks outside Louisville, and we knew something like that would be much easier on the wallet than a motel. We left for Kentucky late on Friday, after work, and ended up after a few hours’ drive in General Butler State Park in Carrollton, Kentucky, about an hour north of Churchill Downs. It was unseasonably cold and damp, and the van’s heater had barely kept us warm on the ride down. We arranged ourselves for the night as best we could within the confines of the van, one of us on the van’s bench seat and the other two on a tiny mattress between the two wheel wells in back. Not the most comfortable arrangements for grown men, but we were more concerned with price than comfort. Fortunately there were bathroom and shower facilities at the park, which allowed us to freshen up and get some warmth. 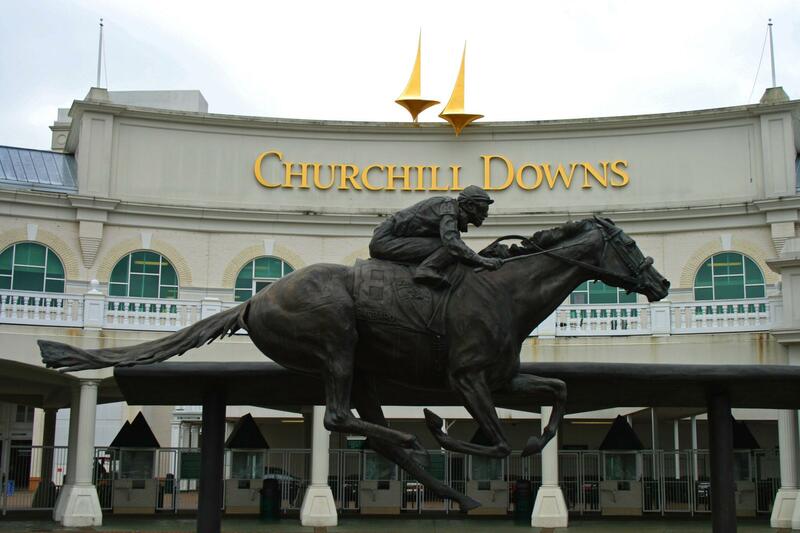 The next morning, after a night of snoring in the cold and snatching warmth where we could, we headed to Churchill Downs. The sight of the Downs got our blood flowing, and the excitement of actually being there finally allowed us to forget how cold we’d been. We entered the infield with our cooler – which was still allowed then – and our folding chairs and staked out our spot for the races. The day was still chilly, and the grass was damp from the rain, but we were still determined to enjoy ourselves. One race after another was run leading up to the Derby. The lines for the betting windows were so long that it was necessary to get back in line almost immediately after the last race was run. There was none of the customary between-race down time. Much of this was due to inexperienced tellers who had been hired just to work the infield on Derby weekend to work the infield. Many of these temporary workers had only had a short training session on how to make wagers, which left the experienced tellers in the grandstand, waiting on the people who paid a lot of money for their seats and, naturally, expected short wagering lines. The wait to bet allowed us to talk to the others in line, and swap information on horses we liked and didn’t like. People shared their experiences from prior Derbys and talked about where they were from, how far they had traveled, how many times they’d been. We met and saw people from all over the country and around the world; I had somehow forgotten, until that point, that the Kentucky Derby is a global event, not just our biggest race. The people, most of them extremely friendly and outgoing, made even waiting to bet an interesting and fun part of the infield experience. All over the place we saw intoxicated young people, ladies in fancy dress with hats to match, and many folks wearing costumes that were, maybe, somewhat silly, but nevertheless seemed appropriate for horse racing enthusiasts on Derby Day. It’s fair to say the mint juleps were flowing; we saw more than a few over-served people hauled off to the makeshift infield jail and infirmary. The infield, and the entire Derby experience, was all that we’d heard it would be. Not long before post time, the horses began to walk from the backside (the stable area at Churchill Downs) over to the paddock. We pushed our way through the crowd and up to the infield fence to see them walk calmly through the golden light of the setting sun, accompanied by their owners and trainers. This walk over is still a sweet, somewhat magical part of the Derby experience. You can feel the anticipation begin to build on your shoulders as you stand there. After the horses were saddled for the race, they made their way to the track to the strains of the University of Louisville band playing “My Old Kentucky Home,” accompanied by roughly 130,000 voices singing along. It was one of the most moving moments of my initial Derby experience, and an element I still look forward to every year. As for the Derby itself, Ferdinand, trained by Charlie Whittingham and with the legendary Bill Shoemaker aboard, came in at odds of 17-1. I liked several other horses in the race more – and wagered accordingly – but I did put down $2 win on him, which gave me a winning wager at my first Kentucky Derby. Not only that, he paid $37.40. And so, after watching the rest of the card, we headed back to Cleveland around 7 that evening with empty pockets and full hearts, as the saying goes. The three of us talked the entire drive about what we’d just experienced and how we would never forget this trip. Around ten that evening, we drove onto a bridge over the Ohio river. Almost immediately, we noticed the headlights on the old van growing dim, a sure sign that our alternator was beginning to fail. About halfway across – and this was a 4-lane highway bridge – we were forced to pull to the shoulder. Which meant we were three guys on a bridge in a dead van, with no cellphones and no idea what we were going to do. By this time it was getting pretty cold. We decided that someone would have to hitchhike for help. We also figured it would be better if two guys went, for safety, while one – me, since I’m basically mechanically hopeless – stayed behind with the van. Thankfully, it didn’t take long for a truck to stop and offer my companions a ride into the next town to get help. I sat there in the dark, bundled up in a thin blanket, for what seemed an eternity before I finally saw the flashing lights of a tow truck approaching. They hooked up the van and towed us to an old Standard Oil SOHIO station on the outskirts of Cincinnati. Unfortunately, a mechanic wasn’t available until the next day. By now it was past two in the morning, so we decided to find a place to sleep for the night. Fortunately, there was a motel across the street from the station. Unfortunately, it was prom weekend in Cincinnati, and all the rooms were booked. Fortunately, there were other motels in the area. Unfortunately, they, too, were full. The only option was to sleep in the van again, this time in a gas station parking lot. And so we passed another cold, cramped night in the van. The next day was Sunday, and we woke to find, essentially, nothing. No mechanic on duty, no open repair shops, nothing that served to offer even the barest sense of hope. By this point, we were all getting a little frustrated. My friends were sure they could replace the alternator themselves, and we got lucky and found an open car parts store about half a mile away – although, naturally, the SOHIO attendant said we couldn’t use his tools because it was against store policy. Fortunately, the parts store had what we needed, and as my friends struggled with the problem in the chilly morning, I ran across the street to a fast food place across the street to get some coffee and snacks. While there, I saw a few elderly patrons reading racing forms. Not knowing where the heck we were, I asked one of them where the nearest track was. 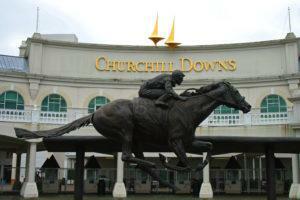 It turned out that the next exit down the highway led to River Downs, Cincinnati’s venerable old thoroughbred track. I had only ever visited it once, years before, but I’d had a great time. These two gentlemen then offered me passes to get into the races for free that afternoon, which I accepted with profound gratitude. Back at the van, the struggle to replace the alternator continued. I sat in the van reading the newspaper and staying inconspicuous while the mechanics worked to get us home and occasionally taunted me about my lack of mechanical know-how. Once in a while, one or the other of them would grunt a curse or two, which I could only assume was directed at the alternator. They succeeded in getting the van to run again eventually, and we headed back out and toward home. This lasted about five minutes, right up until we spotted the sign for River Downs. I’d like to say we drove right past. I’d be lying, of course. From Churchill Downs to River Downs and back to Cleveland in seventy-two hours, in a creaky old panel van with a half-broken heater. An experience I’ll certainly never forget. I’m preparing this month to sit in the infield for my 34th consecutive Derby, but I’ll always treasure the first one, and the men who helped make it one of the most memorable adventures of my life.